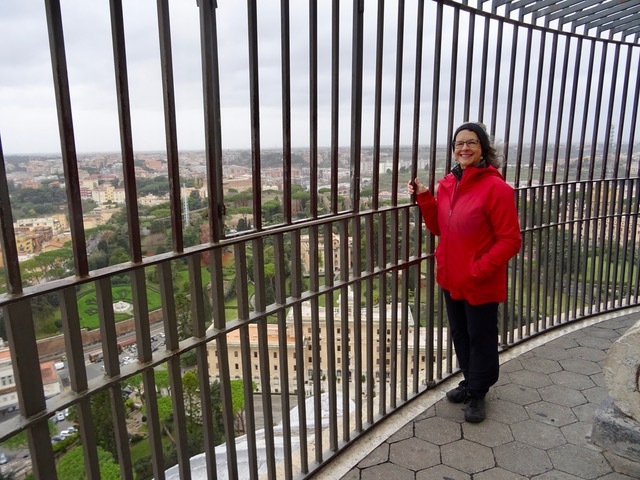 Climbing St. Peter’s Dome and Not so Wonderful News! 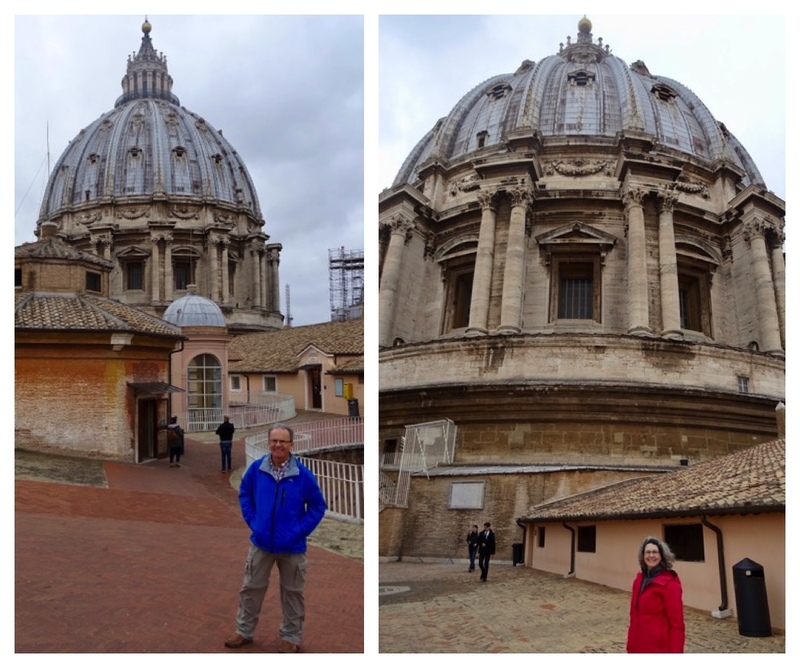 This was our last day in Rome, and I really wanted to climb the dome at St. Peter’s so that is where we went today. It was cloudy and windy but it wasn’t raining so that is good. I think they close the dome when it is raining so I kept my fingers crossed that we get to do this today. After a twenty-minute wait to get through security there is no wait to climb the dome. I was willing to climb all 551 steps to the top but Bob thought we should take the elevator for the first 231 steps so we did that. 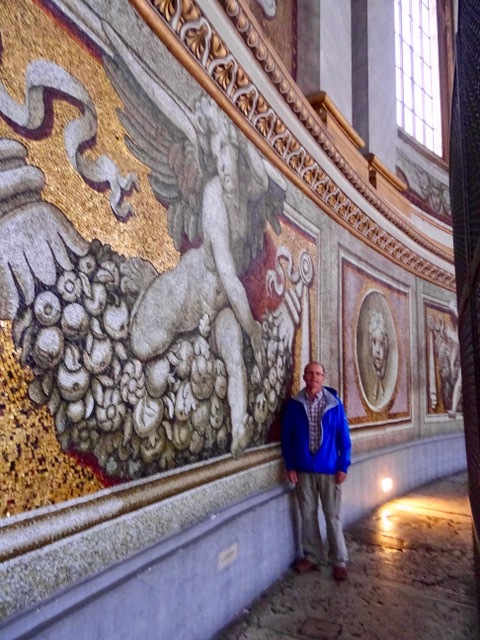 When we get off the elevator we go inside the dome and get an up close look at the mosaics and the beautiful interior of the dome. We will be climbing up to that little circle of light high above us! Everything in the Church far below us looks very small. This is the area where the service for Peace in the Congo and the Sudan was held the first time we came to St. Peters. This is our third visit to St. Peter’s. 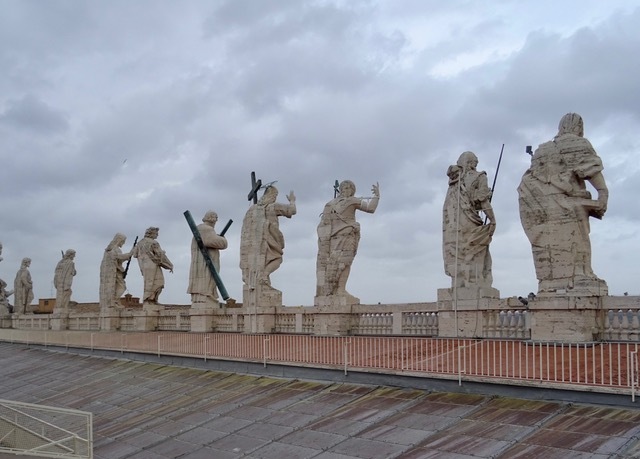 From one of the windows, we see the backs of the huge statues on top of St. Peter’s. 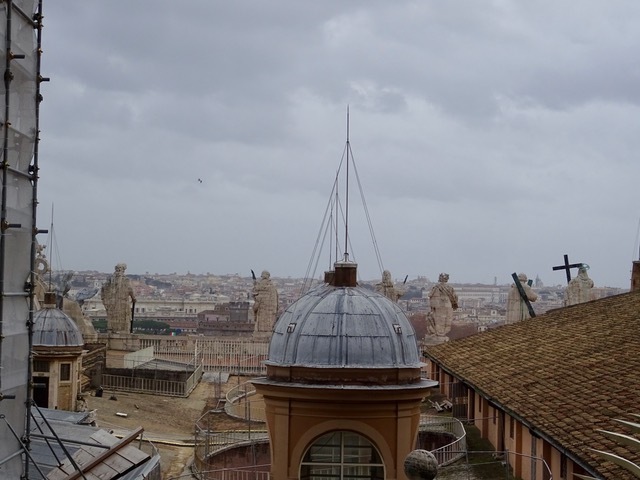 There are another 320 steps that we climb to get to the cupola on top of the dome. 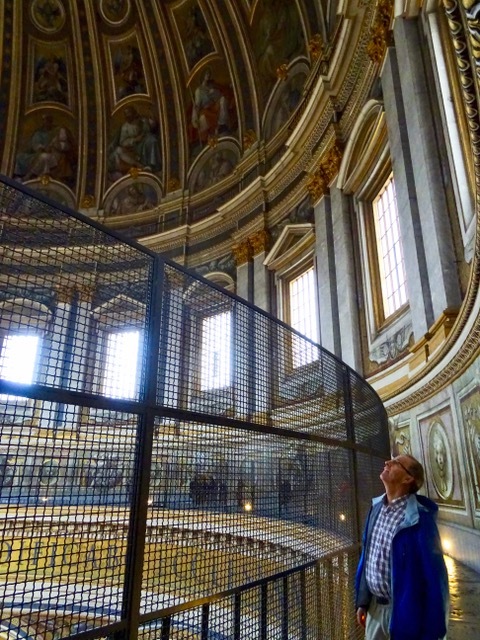 We are inside the walls of the dome so they slant quite steeply. It is very strange to walk with such sloping walls. The stairs get progressively smaller and more enclosed. I wouldn’t recommend this climb for anyone with claustrophobia. 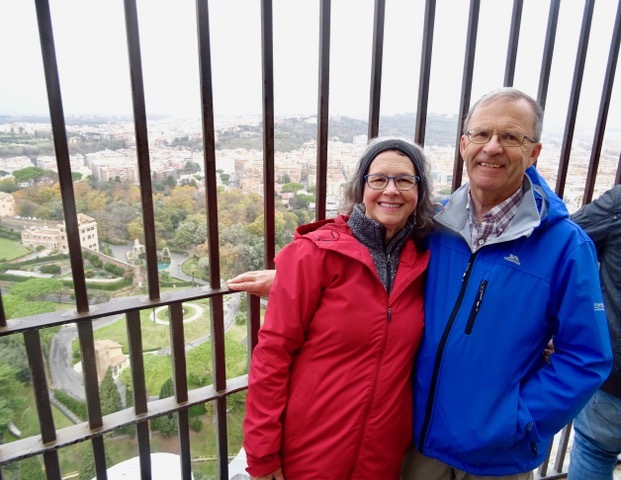 Here we are on the cupola high above the ground. At 450 feet high, this is the tallest dome in the world, and we are standing on it! On the way up I took the first photo from a window. It felt pretty high already. 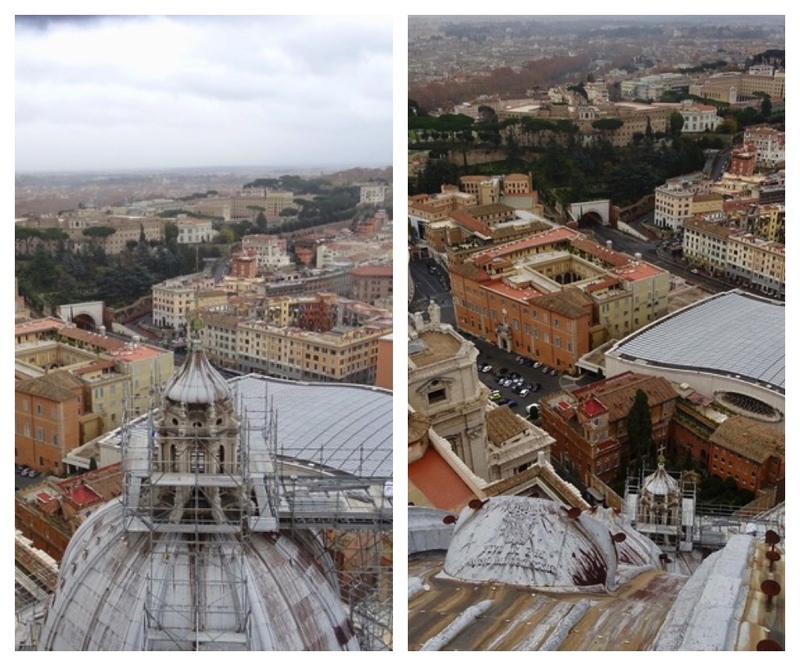 Notice the dome with the scaffolding in the first photo, and then see how much higher we climbed by comparing it to the same dome in the second photo. 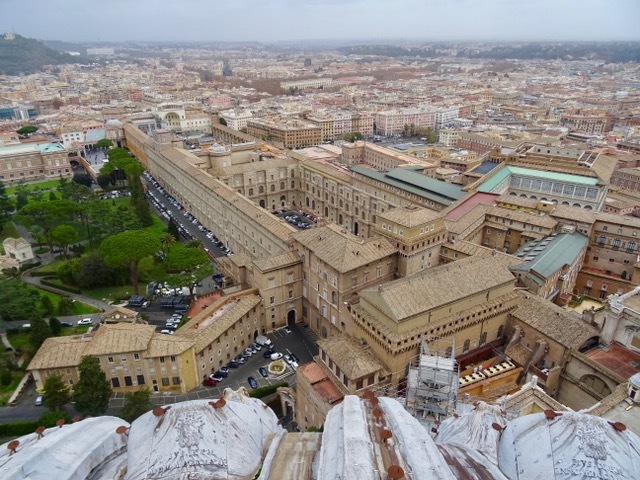 This is the Vatican Museum and Sistine Chapel. You can see how long the hallways were on either side of the interior courtyard. 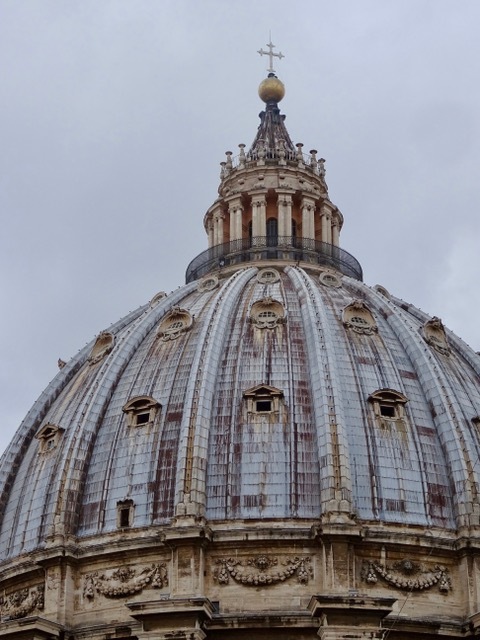 Also there were inscriptions carved onto the roof of the dome with Pope’s names and dates.You can see them in the bottom of the photo. 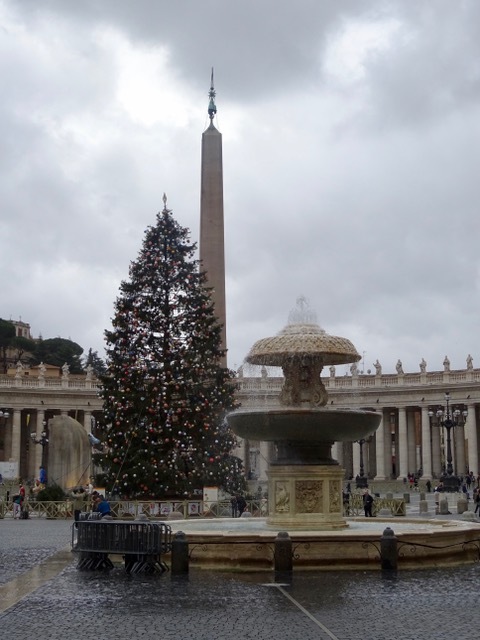 St. Peter’s Square with the Christmas tree, and the road that leads to the river and the Castel Sant’Angelo. The view from up here is amazing even with it being an overcast day. It is very windy but no rain, so we are happy. We spent at least an hour up here, just enjoying the view. We even had our tea and cookie break on the sheltered side of the dome. Not sure if we will ever get back here so we wanted to soak it all up! 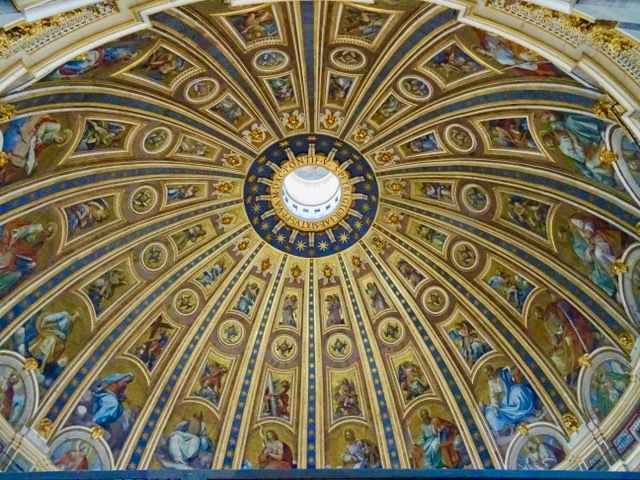 This is looking up towards the cupola just above our heads. 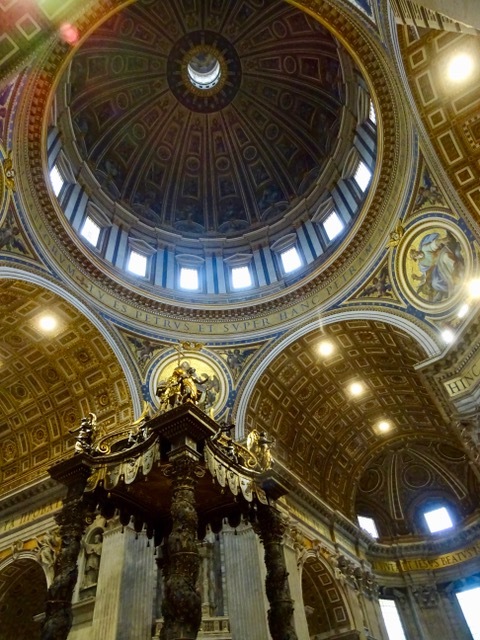 These are the windows that are visible inside the church at the top of the dome. 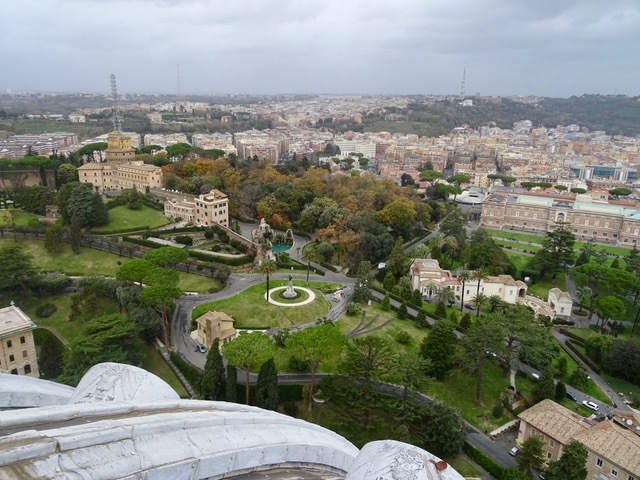 The Vatican Gardens look beautiful. We didn’t get a chance to tour them, maybe another visit? This photo clearly shows how apartments are often built around an inner courtyard that is not visible from the street. Also another look at an inscription on the dome. 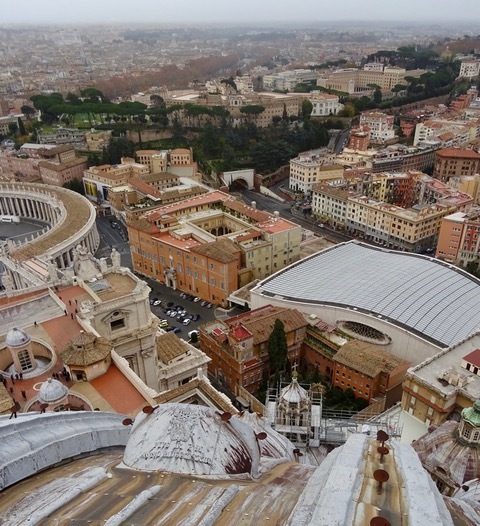 We climb back down the 320 steps and we are delighted to discover that we get to walk the roof of the basilica. How amazing is that? 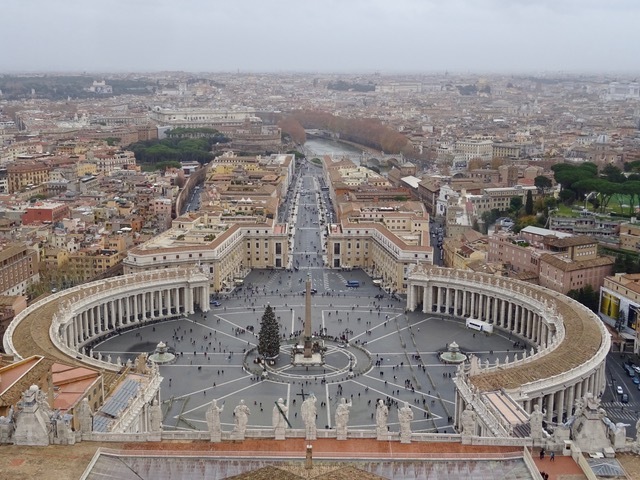 We get up close and personal with the huge statues, check out a souvenir shop, a cafe and the bathrooms, all on the roof top of St. Peter’s! 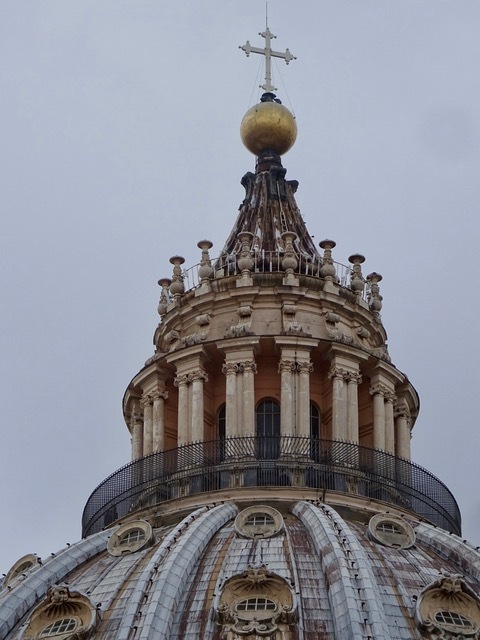 There is a great view of the dome from the roof top. We were right up on the top, behind the railing. I was very excited about the whole visit. 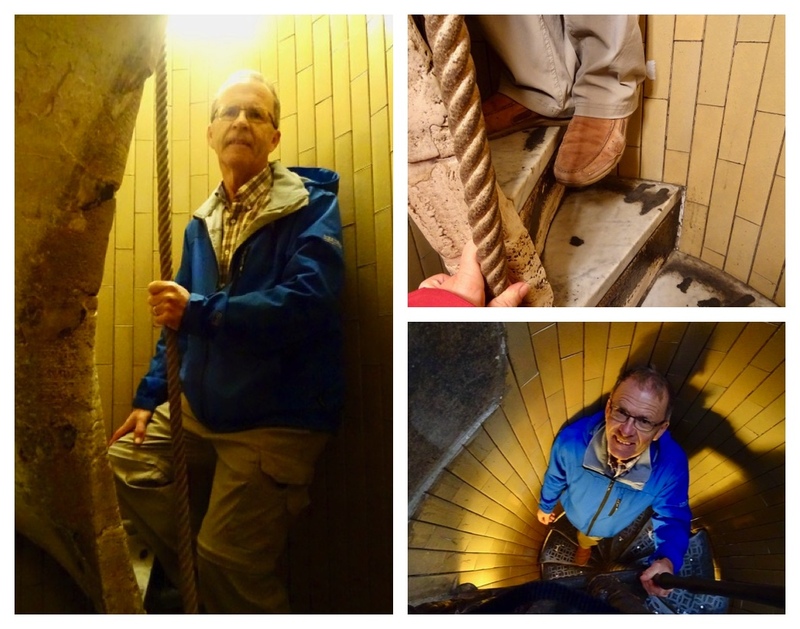 We walk down the last 231 steps and emerge inside St. Peter’s. Looking up at the dome it is crazy to think that we were up there. We were on the inside just below the windows and then on the outside away up above that tiny opening, which isn’t really all that tiny and walking above these beautiful ceilings! 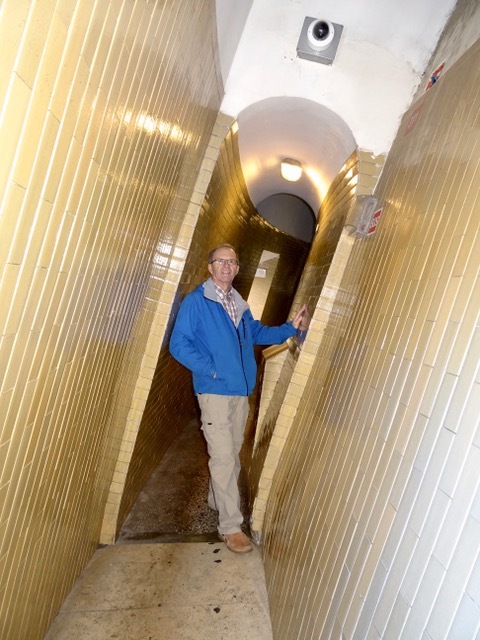 We visit the grotto below the church which contain chapels dedicated to various saints and tombs of kings, queens and popes, dating from the 10th century. 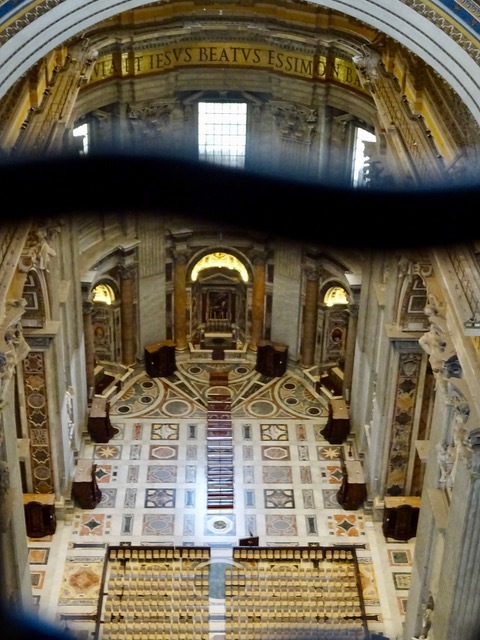 The holiest place is St. Peter’s tomb, visible on the right side of this photo. 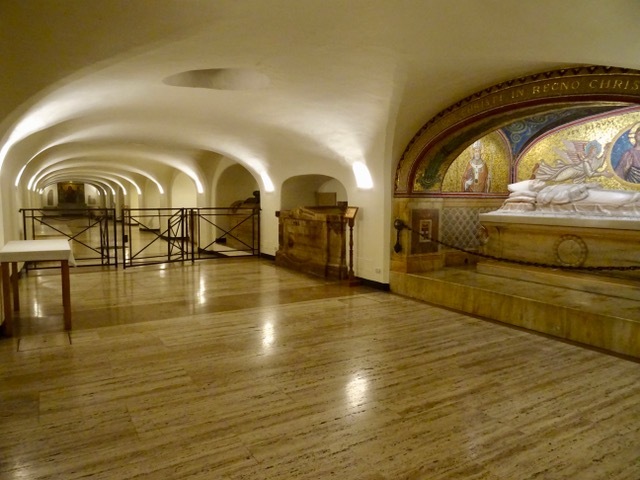 The monument to Pope Paul VI (1978) is here but the tomb of Pope John Paul II (2005) is upstairs in the church. 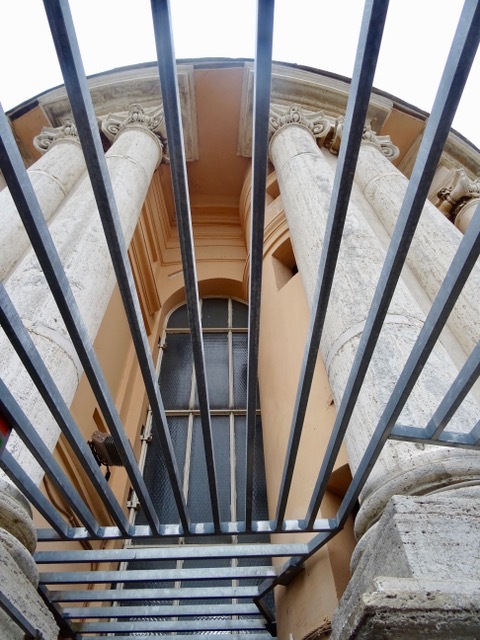 I took a photo before I was told that no photos were allowed and it just happened to be this one of St. Peter’s tomb. 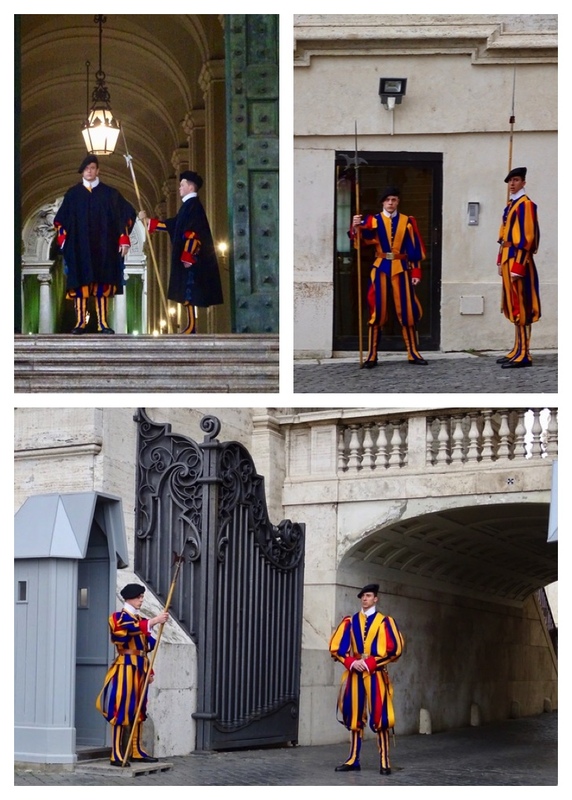 Back outside we watched changing of the Swiss guards. I love their uniforms. They are inspired by Renaissance uniforms and they are the colour of the House of the Medici. On our walk back to the metro we pass shops that sell robes for the clergy. This was a surprise for us but I guess they need to buy these vestments somewhere. We wonder if you need to show ID to make a purchase? When we arrive home we check our flight to Amsterdam tomorrow and find out that it has been cancelled due to bad weather in Amsterdam! This is the third flight that has been cancelled on us this trip!! We spend the next five hours trying to figure out how we are going to get home. No use booking another flight as it may get cancelled too, and there are no busses that would get us there in time. The train can only guarantee to get us to the German-Netherland border and then we “should” be able to stay on the train and just pay the conductor to get to Amsterdam! That means there is a chance we might get stranded at the border late at night!! In the end our best option is to rebook our flight and fly from Rome to Munich, then to Reykjavik and finally home. Instead of a short flight to Amsterdam, a relaxing night in a hotel and then a flight home, we now have a 24 hour travel day starting at 4 am and it cost us a lot more money!! Oh well, we decide to not worry about it and at least we will still get home on December 13th. Luckily we are able to book another night in our bnb so we didn’t have to move somewhere else for one day. We finally get this all sorted out near midnight. Not a nice end to a lovely day in Rome.